Take advantage of winter’s bounty and make our slow-cooking Guinness Stew on a chilly weekend when you plan to putter around the house all day. Sprinkle meat with kosher salt. Put flour in a bag; add meat and shake to thoroughly coat with flour. In a large heavy stockpot or Dutch oven, heat half the canola over medium-high heat. Add half the butter, then add half the beef. Cook 5 minutes, turning to brown on all sides. Remove meat from pan with a slotted spatula or spoon. Set aside and add remaining oil, butter and beef. Repeat the browning process, removing beef at the end. Set beef aside. Add mushrooms to pan and cook 2 minutes. Add onions; cook 5 minutes until they start to become translucent. Stir in tomato paste and cook 1 minute, stirring paste into onion mixture. 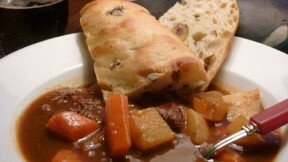 Stir in beef broth and Guinness; scrape pan to loosen any browned bits on the bottom. Return meat to pan, stir together and bring mixture to a boil. Cover, reduce heat and simmer for 1 hour, stirring occasionally. Uncover pot and bring back to a boil. Cook 50 minutes to reduce the sauce, stirring occasionally. Add rutabaga, carrots, parsnips and turnips. Cover, reduce heat and simmer 1 hour, or until vegetables are tender, stirring occasionally. (Rutabagas take longest.) Uncover and bring mixture to a boil. Cook an additional 10 minutes, sprinkle with parsley and serve with crusty bread and a crisp green salad.